The travel & tourism market in North America is a mature and organized market and the second largest in the world. According to the UN World Tourism Organization (UNWTO) Report 2018, the number of international tourist arrivals in North America (including Caribbean and Central America) increased from 97.1 million in 1995 to 174.0 million in 2017, holding a market share of 13.0% in 2017 of global international tourist arrivals. The average annual growth from 2005 till 2017 was 3.7%. The U.S. is the largest travel and tourism market in North America. The U.S. travel & tourism market is the largest and most organized and mature market in North America. As per the UNWTO Report 2018, the number of international tourist arrivals in the U.S. increased from 60,010 in 2010 to 76,941 in 2017, holding a market share of 36.5% in 2017 of international tourist arrivals in the whole of the Americas. The travel & tourism market in Europe is the third largest in the world and is also a mature and organized market. As per the UNWTO Report 2018, the number of international tourist arrivals in Europe increased from 308.5 million in 1995 to 671.7 million in 2017, holding a market share of 51.0% in 2017 of global international tourist arrivals. The average annual growth from 2005 till 2017 was 3.3%. In the Europe travel & tourism market, Germany, the U.K., and France are the top three travel and tourism markets. Germany is the largest travel and tourism market in Europe, followed by the U.K. and France. Asia Pacific is the largest travel & tourism market in the world and is a growing market. As per the UNWTO Report 2018, the number of international tourist arrivals in Asia Pacific has increased from 82.0 million in 1995 to 323.1 million in 2017, holding a market share of 24.0% in 2017 of global international tourist arrivals. The average annual growth from 2005 till 2017 was 6.4%. In the Asia Pacific travel & tourism market, China, Japan, and India are the top three travel and tourism markets. China is the largest travel and tourism market in Asia Pacific followed by Japan and India. Middle East & Africa (MEA) is a growing travel & tourism market. As per the UNWTO Report 2018, the number of international tourist arrivals in MEA has increased from 31.4 million in 1995 to 120.8 million in 2017, holding a market share of 9.0% in 2017 of global international tourist arrivals. The average annual growth from 2005 till 2017 was 4.9%.In the MEA travel & tourism market, GCC and South Africa are the top two travel and tourism markets. The South America travel & tourism market is a growing market. As per the UNWTO Report 2018, the number of international tourist arrivals in South America increased from 11.7 million in 1995 to 36.7 million in 2017, holding a market share of 3.0% in 2017 of global international tourist arrivals. The average annual growth from 2005 till 2017 was 6.0%. Brazil is the largest travel and tourism market in South America. 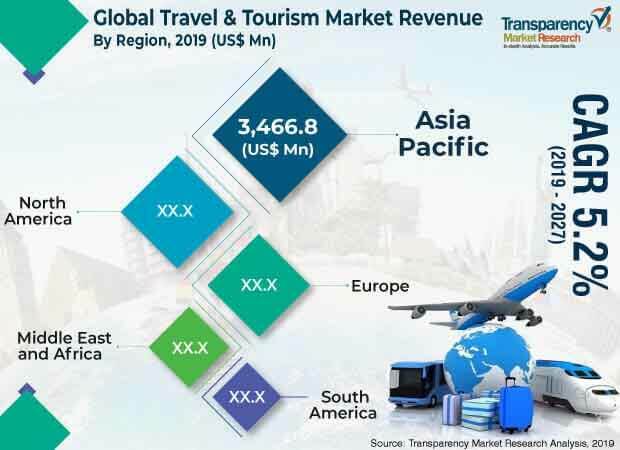 The report highlights major companies operating in the global travel & tourism market including TUI Group, Hilton Worldwide Holdings Inc., Carnival Corporation & plc, Airbnb, Inc., Crown Resorts Ltd., Accor plc, Balkan Holidays Ltd., G Adventures, Adris Grupa d.d., and OYO Rooms.